My thirteenth ground of 2019 was on Monday 18th March at Scours Lane in Reading, Berkshire. 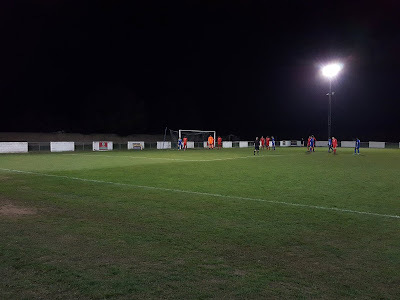 The match was Reading City vs. Flackwell Heath in the Hellenic League Premier Division. Scours Lane is in the north-west outskirts of Reading on the banks of the River Thames. The football ground is on the western edge of a sports complex with a cricket pitch, mini football pitches, basketball courts and the Ibis Health Club due east. The river is a stone's throw to the north and there is an industrial park to the west. To the south is the ground car park which is accessed by going under a bridge which supports the Great Western main line running from London Paddington to Bristol Temple Meads. Unsurprisingly it is near a couple of stations with Tilehurst one mile west and Reading West 1.5 miles to the east. 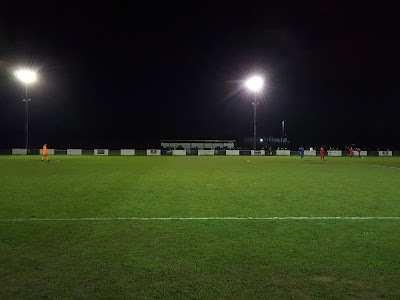 The club formed as Highmoor Ibis in 2001 and played at the ground until 2011 when they departed to it not fulfilling Hellenic League requirements. After five years of groundsharing the club moved back in 2016 once upgrade work had been completed before renaming themselves as Reading City in 2018. There is a sole all-seater stand at the venue which is a 112 seat structure just to the north of the halfway line on the eastern side of Scours Lane. The remainder of this side is uncovered hard standing though there is a very large grass area behind this. The south-east corner has a temporary looking clubhouse building which nonetheless has a smart interior. There is a food outlet facing outwards onto a patio area with tables and seats. The western side has an expanse of flat concrete standing for its length barring a covered section just to the south of the halfway line. This is set a long way back from the pitch and has a slightly elevated platform for spectators. The two dugouts can also be founded on the western flank. The southern end continues in a similar vein with a concrete foundation for the whole end. The area set back from the pitch has a covered stand for most of it length with a two-level platform as well as two rows of seating towards the western side which adds another 50 seats to the venue's total. The south-west corner then has a building for the player and officials dressing rooms. The northern end is the most basic with a strip of uncovered hard standing backing onto with a large grass area behind. 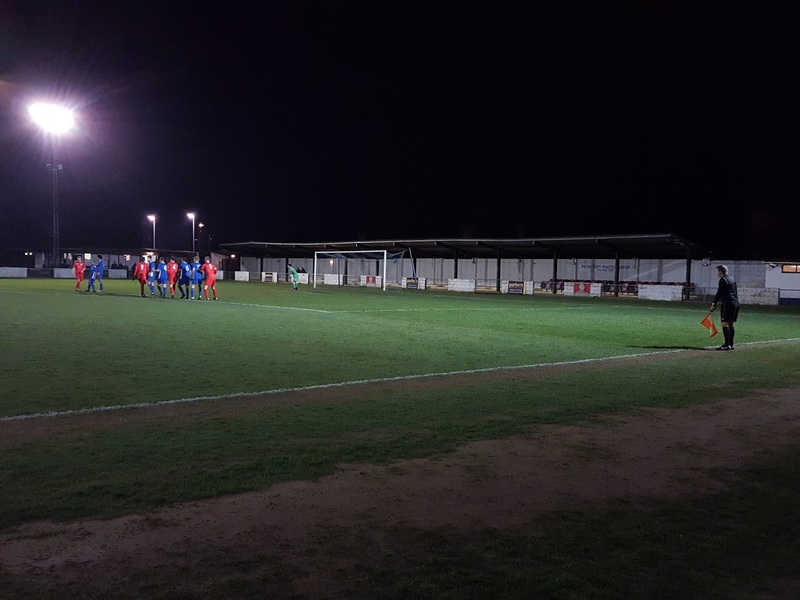 The two sides were towards the bottom of the Hellenic League Premier Division with Reading in particular in need of a few more points to secure safety. It was a cagey start to the match with little for either keeper to do. 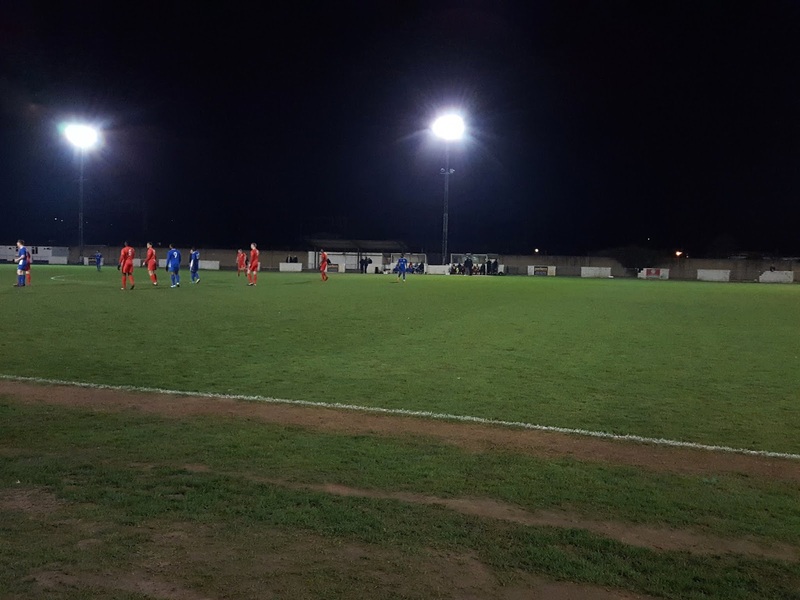 In the 25th minute a free-kick into the box caused confusion in the home defence as the ball fell to Dan Bailey. Though his initial shot was saved the ball bounced around the crowded area before coming back to Bailey who slid in from a few yards out to give the visitors the lead. Flackwell played some good football after this with several dangerous crosses into the area. Five minutes before the break Mo Ceesay danced into the area and his strong low shot was saved well at the near post to prevent the away side going up two goals up at the interval. Reading's best play of the match came in the 57th minute when a great cross from the right found Lorenzo Medford at the back post but his point blank header was saved Aaron Watkins who had positioned himself well. The second half was a poor spectacle with the next action of note coming when the away side were reduced to ten men with a quarter of an hour to play. Subsitute Tyrese Corbin-Chandler received a straight red for a wild tackle and there were no complaints from Flackwell Heath. Even after their red it was the visitors who looked the more likely to score with Mo Ceesay going close late on. Reading's keeper saved them on that occasions but with his teammates drawing a blank at the other end it was another defeat for City and a nervous final few weeks of the season.